Many of the most spectacular astronomical objects are found in the southern skies. 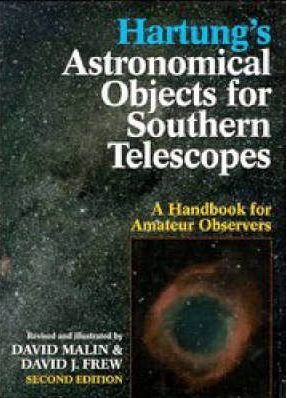 With this up-to-date, superbly illustrated handbook, both the amateur with binoculars and the expert with a telescope can make discoveries about new and interesting objects. Professor E. J. Hartung first produced his comprehensive and highly respected guide in 1968. Now the book has been greatly expanded and thoroughly revised, enhancing its character as an indispensable information source. With over 150 illustrations (over sixty in colour), new material is included on constellations and celestial co-ordinate systems with more modern descriptions of stars, nebulae and galaxies. A new ‘southern Messier’ list of objects is included. The authors’ passion for their subject makes this a unique and inspirational book. Many of the beautiful photographs were taken by David Malin, the world’s leading astronomical photographer. The result will fascinate active and armchair astronomers alike.